For a moment let’s venture out of the world of themed entertainment into other media. How many books, movies, or plays dare to presume what your internal world is like? Very few. There are conventions that allow it, you might remember learning briefly about second-person narration in English class, but there’s something pretty weird about reading something that says “You walk here, do this, and feel that” when you know very well that you did none of those things and did not feel like that. 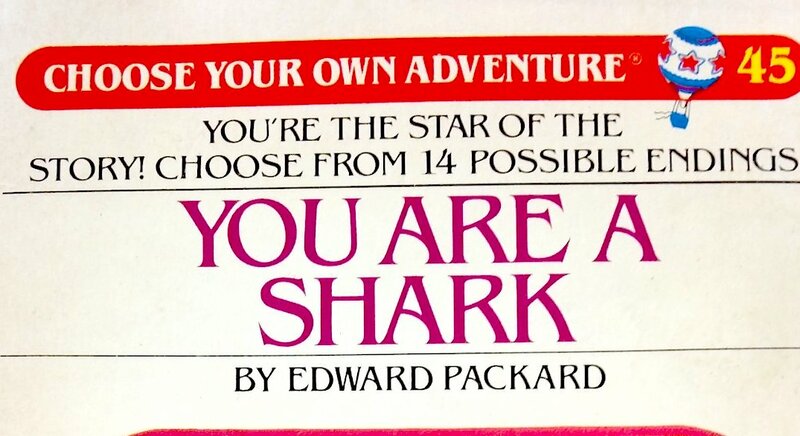 The media that does use a second-person voice most often comes in the form of choose your own adventure novel, giving at least some chance for your own internal experiences to line up with the story at hand – though the story itself usually suffers. Instead it is much more common for there to be an audience insert character – a character we grow to empathize with and care about and follow. Our own journey is created in our mind relationally. We cry at their pain and cheer at their victory and imagine what it would be like for us – but the book, movie, show, rarely requires us to be anything other than ourselves. Even in video games, there is usually an avatar we control and play the role of figuratively, but that character is often viewed in the third person and it is understood that at no point am I really the character on the screen. Because of course I’m not, I’m the girl with bloodshot eyes sitting on the couch in her underwear swearing at a tv screen because I can’t jump and fling a grenade at the same time. And yet, too often, themed attractions attempt to convince us that we are really there and it all really is happening and just to us despite the fact that I’ve seen 2000 people go on before me, paid a months salary to be here, seen a “legally required safety video”, and am utterly unprepared for the trip (Kudos to Wild Arctic for pointing out that shorts and t-shirts are not arctic gear). These types of attractions seem to do nothing but tell us things about our circumstances we know can’t be and aren’t true or make no sense and then hinge their stories upon them. Sometimes its subtle enough that it makes no real difference. Rex told me every time I went on the original Star Tours that it was my first flight, and his too despite me having ridden it enough to memorize the script. Other times, the dissonance is so strong that it just leads to an uneasy sort of laughter and a momentary disconnection from the experience. This is perhaps most evident today with the overabundance of themed escape rooms where, to sum up one I experienced in Hollywood last year, an intern is locked in the experience with you, yet strangely not panicked, no one really is, and she’s also the person you go to for hints at how to solve the puzzle. At that point the role playing and story just become dreadfully awkward and superfluous. An awkward conceit to get the plot moving. It becomes unbelievable. These types of situations are a natural result of the focus on explicit story that was ushered in as the ‘90s came about. In particular, designers focused too much on telling the story of us rather than the story of the world. Tell us why the characters are there yes, tell us the why the environment is the way it is sure, but don’t presume to tell us why we are there. This is a difficult line to walk because themed entertainment gives designers and storytellers tools that they don’t have in other mediums. Especially in the case of rides, designers do have the ability to do some second person storytelling that will ring true. They can control what we see, they can control what happens to us, they can control where we are, and they can control what we know of the fictional world. But what they can’t control is our knowledge of reality, our motivations, feelings and internal world. In the best case scenario they might eventually convince us to forget those things temporarily in the awesome power of the moment – but that is something achieved with great effort and crafting, not the moment you walk in the door. In short, if designers want to avoid cognitive dissonance they can put us in a research library but not tell us we’re researchers. They can give us a mission but not assume we want it, and only if we have the tools to accomplish it. Aka why is it my job to save the All Spark when Evac can do it just fine by himself? The story tells us we’re navigators but exactly what navigation do we do? What navigation knowledge do we posses that Evac doesn’t? We’re given a role but never able to fulfill it. Or in ET Steven Spielberg himself tells me ET needs my help – trying to walk the line between being the director of a fictional movie and trying to convince us the fiction is now real. Furthermore, giving this mission to 60 people at once and a queue-full more ahead of me makes the mission ring much less true. A certain distance is created between the content and the audience. Cognitive work is required to square the differences. Wouldn’t the storytelling have been made infinitely easier if we were searching for ET, or on a bike ride for some (or no) other reason and then he hopped aboard to be rescued? Then no cranial gymnastics are required – the illusion of a personal experience preserved. As I’m fond of repeating: don’t raise questions if you don’t have good answers for them! The guest can fill it the details better than you ever can, and it will come with the added bonus of the story becoming more personal and meaningful. Our brains are always writing the story of ourselves. Try not to interfere with that process as much as possible. Maybe a guest wants to pretend they’re Nancy Drew, and that’s the story they tell themselves. But maybe a guest wants to just appreciate the scenery, or spectacle, have a thrill, take a nap, enjoy the air conditioning, etc. It’s not up to the designer or storyteller to tell the story of the audience member, it’s their job to tell the story of their own characters and world by shaping the experience of the audience member. In some respects the beauty of themed entertainment when it’s done well, is that the audience is given the illusion of becoming the storyteller. Mr. Toad’s wild ride is the absolute best example of this: still after over half a century. I’m nearly 30 years old and yet every time I go on I can’t help but be transported into the world and take that useless steering wheel into my hands. This is a ride that offers no story for why I, the rider, am there. It doesn’t presume. It merely tells me what happens to me, and even then it’s not entirely clear if I’m a bystander or protagonist. In a way I’m both. In this way, the best attractions often function as dreams – as I’ve talked about in my analysis of Pirates of the Caribbean. In dreams we are both subject and bystander, in the story yet writing it, in control but also not. Our choices feel free but are not. The stakes feel real, but we know we’re safe. Even nightmares can be an illustrative model: demonstrating that at a certain level of emotional intensity our knowledge of reality slips away and we become one with the experience. Which I think is the ultimate goal of any form of entertainment – to get to that point where everything disappears and you’re one with the experience. Story functions in service of getting us to that point. And if cognitive dissonance is what takes people out of an experience, and cognitive dissonance is created when the audience is told a story about themselves that they know isn’t true, then who better to write that story than the audience themselves? This is how storytelling works and what we already do with most other forms of media. When we watch Beauty and the Beast we don’t just see Belle grieving over a love she thinks she’s lost, we see our own losses, our own stories and project them onto the scene we see. But in themed entertainment it can be taken farther since the audience-member gets to have their own new experience too and it happens simultaneously. Rather than have the audience call upon their memories to empathize, they can call upon the current reality happening to them. Effective stories require control. The flow of information is carefully moderated to construct a particular experience in the audience. True role playing requires the freedom to act as another person and have autonomy. The temptation is there, since themed entertainment brings things into the real world and puts you at the center of the action to assume that role playing is the way stories are best told in themed attractions, or for that matter possibly in VR, but as as can be seen they’re somewhat contradictory. You can’t simultaneously tell a story about a person and let that person control the outcome. So the solution is to refrain from forcing the audience into playing a role that isn’t theirs. The story you tell can’t be about them, it must be about the setting or characters in that setting of which their own experience you can shape into something that echoes and informs it. And they have the choice of the role they play. The key is creating an experience that integrates our experiences with the scenes that unfold. There are multiple ways to achieve this. Classic attractions generally did it by abstracting the ride vehicle out of the diegetic world. Mr. Toad’s Motorcar, Snow White’s Bed, the Pirates Boat, the Haunted Mansion Doombuggy: these are not meant to be literal parts of the storytelling world, more impressionistic reflections that enable us to access it – just like the presence of the camera or score in the diegetic world of a movie is ignored. Presentational attractions of the ‘70s and ‘80s took this a step further by abstracting the entire experience in a manner akin to much modern theatre – dropping any pretense of the experience being anything more than what it was: a show – finding in the process perhaps much more direct and freeing methods of storytelling. Your options open up when you don’t have to maintain the elaborate posturing of an illusion. And then of course in the ‘90s and ‘00s designers attempted to do this by telling fictional stories about us, but often failed as such stories required too much pretense. Which brings us to today, where things are perhaps starting to change. I think Flight of Passage and Navi River Journey act as good prototypes of what this kind of storytelling can look like when trying to be applied to a “you’re really there” type narrative. Crucially neither attraction requires that we be anything other than ourselves. Yes, both use the tired tourist trope, but thankfully don’t draw attention to it. We’re mostly just going on a boat ride because we got in line to go on a boat ride and we’re mostly going on a flight of passage because we want to fly on a banshee. From that point on the story being presented firmly pivots into not being about us, but about the Navi and Pandora. In the queue we see evidence of their culture, history. River Journey focuses more on the culture of the Navi people themselves while FOP more on the history of the Planet as a whole. Once on board the boat we find ourselves immersed in a gorgeous environment. The ride never tells us why we’re there and it doesn’t need to, it’s self evident. We experience the beauty and preciousness of the world for ourselves – that’s likely to be the story we create for ourselves. And as our journey continues we come across the Navi people worshipping and appreciating the land themselves. The attraction is about these people, and the value of nature, and through our own experience we can come to better understand theirs. Flight of Passage functions similarly. While the preshow is extremely heavy in exposition, that exposition never tells us our own story any more than what type of experience we’re about to have. Instead it gives us the context and significance in how it relates to the story they’re telling about the Navi and the value of this species, and on a broader level nature in general – making the fictional world ever more real. The designers also spend ample time throughout the queue, creating a multi-layered dazzling induction, slowly letting us forget the outside world, our knowledge of it, our motivations, etc, without telling us things about ourselves that aren’t true, making it easier to frame the experience that follows and letting the induction go ever deeper. By the time the main course begins, we’re extremely open and vulnerable. The ride itself gives us an exhilarating experience with a full dramatic arc involving free flight, chase, reflection – story in its rawest form. But it still does not tell us our stories, it lets our minds do the work by giving the experiences to us unfiltered. Rather than complicating everything with needless plot, or an overly present audience avatar (pun intended) a la Forbidden Journey, the story of the moment is all ours, and it’s the context given in the queue – the story of the land and people – that create the meaning the designers want to relate. Again it is our own current experience that can be drawn upon immediately to understand the story being presented. The designers create awe and it’s the framing of that awe that achieves their ends. The essence of this argument is that while the story of the characters and worlds of attractions can be told through relatively conventional means, the stories of us, the audience, cannot really be strictly told or controlled. We can not just be handed new backstory about ourselves. That creates cognitive dissonance, especially if it doesn’t match up with the opportunities at hand. The hardest thing to create is a conceit to get the audience in the world of the story. Except, it often isn’t necessary. The conceit can simply be “this is what we’re going to do” – no explanation required. The story of the audience can only be given to them through raw direct experience. The audience in the process of the ride, becomes the storyteller and the story the designer has created will frame the story they tell. When the experience of the events given, and the theme of the external story align that is when magic happens and the story the audience creates for themselves becomes the story the creator was trying to tell all along.